Well I figured since my car loan is about to be paid off I should prolly start one of these since the mods will start happening. 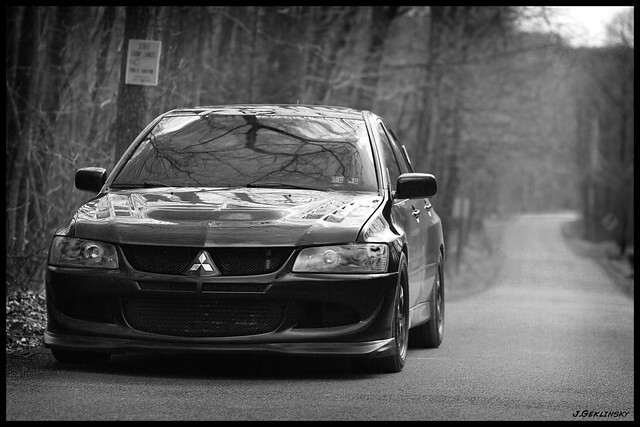 I bought the car at the end of summer last year, 2003 Evo VIII with 85,000 miles. I was originally looking for something cleaner and less miles but the price was right and it’s a DD, meaning everyday… snow, rain, whatever, except when I take the bike. I was pleased with the mods that the previous owner did as well as his attitude towards maintenance. I bought the car with an exedy twin disk, 3” TB exhaust, 10.5 hot side, LC1 wideband, small battery kit, hotchkis springs, manual boost controller, and a tune. The bad about the car: The tune was messed up, at WOT it would break up really bad at 5500rpm. The roof has some pretty serious dents in it right in front of the sun roof. Apparently the owner, 2 owners before me, had the hood pop open on him while he was driving. And it came with stock rims and winter tires on it, again I bought it at the end of summer so I had to do something about that. 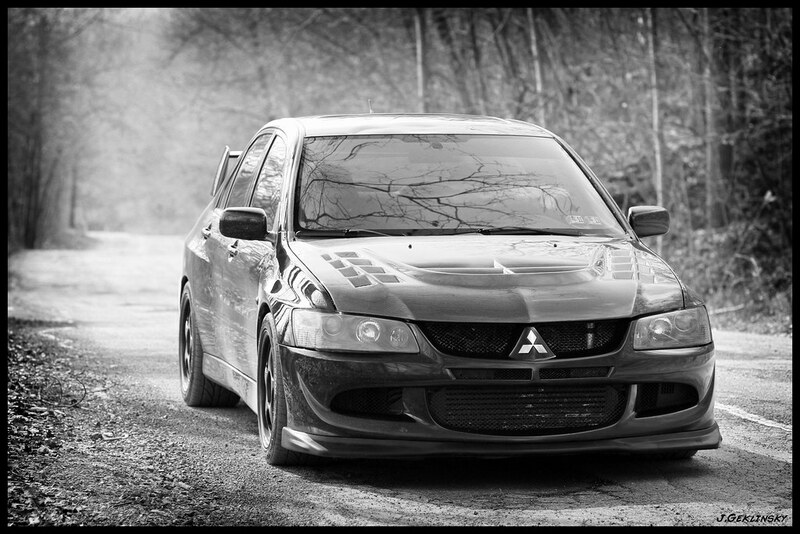 In the mean time I also painted my headlight housings, bought and tinted some evo 9 tails, tinted side markers, bought a ebay polyurethane front lip (after I destroyed the stock one), seibon carbon fiber hood. I have also been tuning it myself, since it’s a daily and I can log every day. Since I got my tune sorted out I took it down to R/T tuning’s dyno day and put down 322 hp/329 tq, which I am happy with. As of right now I have energy suspension master bushing kit and whiteline roll center kit sitting in my garage to go in this weekend. I also have some hella super tones and some short route IC piping. Not sure I’ll get it all done but my tie-rod end is shot so definitely gotta do the suspension stuff. In the near future I plan on some drag racing, maybe a HDPE or autoX. Install some cams and springs. Maybe some new wheels and upgraded sway bars. Possibly a bigger stock frame turbo (FP Green or BBK). Long term I would love to have a big turbo, 3586 or similar and a built block like a long rod 4G64. The car is pretty much always changing so hopefully I keep this updated. Last edited by PAdutch; 01-26-2012 at 10:52 AM. Ill reserve is this for some more of my crappy pics. Thanks for browsing. Nice progress, I'll continue to check in for updates. HTA Green, MR bilsteins, Swift specR springs, and a few other supporting mods would make this a killer daily/drag/autoX/hpde car. Do you have a E85 station near you? I wish I had an E85 station close . Im really thinking about a set-up like your saying for a while until i get the urge to make some big power. That black is gonna be fun. Man if I had the 2.4 sitting around I dont know if I could leave it alone . I think I recognize your avatar from the Bartonsville red robin meet thread, Ive been meaning to make it up there. Yeah I love that picture. I noticed the site is down, I wonder what he's up to haha. He had a couple of good shots of my car. Well the other weekend I put in some energy suspension bushings and a whiteline roll center kit. The feel, turn in and body roll, are much improved. Very happy with the mod. This is the second car I have energy suspension bushings on and for the price theyre hard to beat. Minor update but I feel like I need to do a better job of updating this. While I was at it I finally finished my poly mounts which included the differntial mount bushings and the rear sway bar bushings. I also bought some new rims and tires for the summer: Enkie RP01 17 x 9 and put some 255 Hankook V12s. Im approaching 120k so the 60k service needs to be done. Im debating on putting in cams at the sametime. I got a new camera so hopefully I keep this updated with more and better pics. Pics to come of the diff install and rims. One of the cleanest evo's on TST? I'd say so. Well she's clean when she's not dirty, if that makes any sense haha. How does the car feel with the diff redone? Well its not much of a difference on the street but I can tell a little if I push it. If you get on the gas when cornering it seems to come around better. I am getting a little chatter at low speed hard turns. I put some friction modifier in and it seemed to help but I also think the Amsoil fluid isn't the best. Just now found your member journal. Looks good, man. I have the Energy Suspension master bushing kit waiting to go on. Did your car squeak more after the install? I've heard the red bushings are a b**ch so I went with the black ones. If I had to vote, I think you'd be most satisfied with the Red, if you choose to go stock frame.